In 2017, the global die casting market was valued at USD 62.87 billion, which is projected to reach a value of USD 93.87 billion by 2023. The market is poised to register a CAGR of over 6.93% during 2018-2023 (the forecast period). Rules levied by OSHA and initiatives by NADCA, to improve the technical workforce, are expected to improve the overall production of the die casting market. NADCA is working with several community colleges in the United States to create a die casting farm system. This initiative was undertaken because of the increased automation requirement and the growing demand for highly skilled workforce. The automobile industry is highly dependent on the Environmental Protection Agency (EPA) regulations, owing to the high emissions of automotive units. The step by the EPA, to raise the mile per gallons standards to 35.5 mpg by 2016 and then 54.5 mpg by 2025, has actually accelerated the die casting industry, as the auto industry concluded that the only way it can get to those mileage standards is by reducing the weight of the vehicles. Aluminum die castings, in many of the power train and engine areas, is the one important way in which the industry can achieve this. This, in turn, is likely to fuel up the industry growth, in the area of structural die castings. The die casting market has attracted the automotive industry, which is looking for highly durable die cast parts. Industrial machinery and piping manufacturers are increasingly employing die casting, since the past few years. The aerospace and defense industry is using die cast parts, increasingly. Increased automation in the die casting industry has spiked the productivity and, in turn, is attracting the attention of the automotive and other industrial manufacturers toward highly durable die casting parts. Employment of die castings in the industrial machinery and piping is on the rise since the past couple of years. Employing stronger aluminum components in agriculture and medical devices has also witnessed an increase. Asia-Pacific is the largest market for die casting, which globally accounted for over 58% share in 2017. 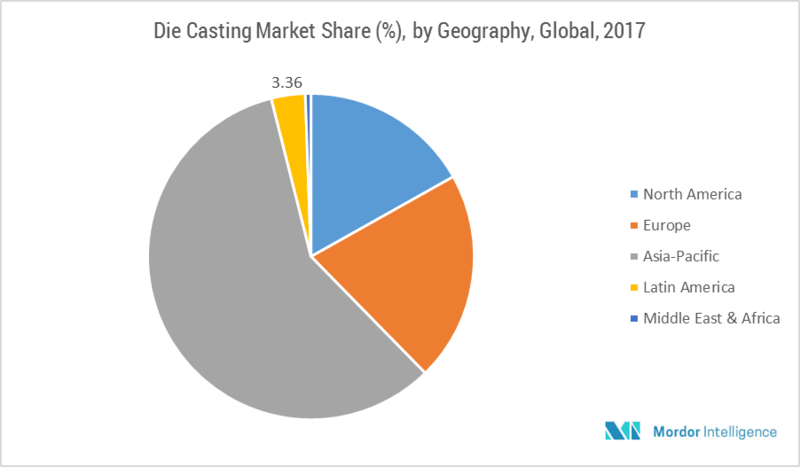 Further growth is imminent in the Asia-Pacific magnesium alloy die casting market for many new start-up companies because of an increasing preference of end users toward lower production costs. Established companies are posing a great challenge in terms of technological, reliability, and quality issues, which is leading to mergers and acquisition signed between smaller and established companies. Technological advancements in die casting revolves around high-tech requirements of the automotive and machinery industries. Over the past decade, major innovations have happened in power, transmission, body, steering, architecture, and instrumentation sectors. There have been advancements pertaining to the safety measures as well. Usage of non-ferrous metals in near net shape cast parts are one such heavily adopted application, wherein focus is given on fine details, involving surface conditions, complex shapes, and economy. Die casting has become a preferred option for the machinery industries, as it can be utilized when there is a requirement in large quantities. Optimum casting techniques, along with best feature of design, help the industry save production costs. Through innovation in product and technology, the usability of die casting industry is increasing, which is further limiting the metal wastage and rejection rate. As a result of all these factors, non-ferrous die casting applications continue to draw the interest of designers. August 2017: Georg Fischer Automotive AG acquired Eucasting Ro, a high-pressure aluminum die casting specialist with two production sites in Romania.